This article is my reflection on Communication and Collaboration models, Chapter 14 from Human Computer Interaction by Dix et al. The chapter describes in detail the communication models of today’s world. It further elaborates each model viz. 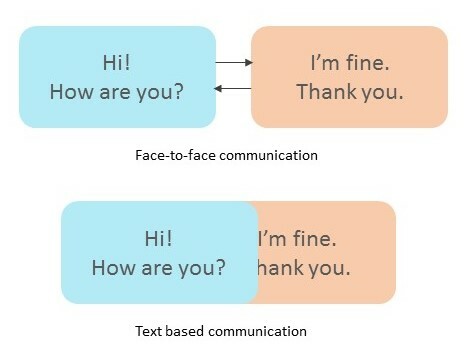 face-to-face, text based in terms of the structure of conversion and the challenges involved. Finally, it explains how group dynamics and surrounding conditions affect communication. The chapter does an excellent job of breaking down the complexities involved in communication. The conversion structure of request and response is thoroughly explained with respect to different communication models. For example, in the face-to-face model, the request and response rarely overlap, facilitating clear and comprehensive communication. On the contrary, while texting someone, people usually tend to write either quickly or slowly causing confusion and ineffective dialogue. This out-of-sync condition might be caused due to of the technological issues in the messaging software which renders wrong metadata about the other user’s typing state. Most of these concepts about communication models are common sense based and don’t involve any rocket science. But learning how stuff works helps in reducing routine communication errors and encourages clear communication. It was an informative read for me which will surely help me in striving hard to communicate my ideas in a clear and comprehensive manner.